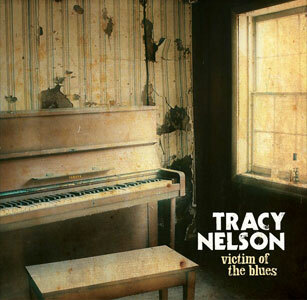 Tracy Nelson first came to prominence with a highly regarded debut album Deep Are the Roots in 1965. Even then this white teenager from Wisconsin was covering Ma Rainey and Bessie Smith. Her subsequent recordings with Mother Earth and her solo albums presaged the country-blues-Americana movement by several years. These days her style leans even more toward the blues. Her latest album Victim of the Blues almost didn’t come out. But it did, and I got a few moments to speak with Tracy about the making of that record. Bill Kopp: On these songs I can almost smell the sawdust on the floor. The problem I have with a lot of contemporary blues albums is that they’re too often very sterile-sounding, as if it’s a front person backed by sessioners sight-reading charts. How did you get an organic feel on these songs? Tracy Nelson: The people who played on it, and the words I sang on it. I had the primo slide guitar player in the world, Mike Henderson, on the album. And Jimmy Pugh — who plays with Robert Cray – is just amazing. He’s not imitating Otis Spann, but he plays like that. John Gardner on drums. And Byron House plays bass on most of it. They love that kind of music. They are major session guys, but actually they don’t play this kind of stuff very much. I’ve used them in one form or another on my last few records. And I had Reba Russell, who’s one of the greatest singers on the earth, singing backup. I used the people who I knew would bring it. And they did. BK: Was the record performed live in the studio or was it layered? TN: No. It wasn’t layered; you can’t get what we’re talking about that way. We tracked in Nashville, and then did most of the vocal overdubbing out here. I don’t believe we did more than two takes on any song. This is blues; everybody in there knew exactly what they were going to play, and just did. You can’t really make a mistake. BK: If you would, tell me the story of the fire and how it affected this record. TN: There was an electrical fire in our hundred-year-old house. The computer in which all of the files for the record were was in the studio, which is the formal dining room of the house. The firemen were wonderful; they got the computer out, but there had been a lot of smoke and so forth. We really didn’t know whether it was going to be salvageable or not. So we backed everything up again; it had been backed up already, but that was in the room with all the smoke too. We had done some backups of mixes on discs, but mastering from that wouldn’t have been very satisfactory. So initially we didn’t know if we still had a record. BK: I hear all sorts of subgenres on this record. “I Know it’s a Sin” has a gospel flavor, and there are dollops of honkytonk, Chicago electric blues, New Orleans styles, etc. Do you view each of these as their own styles, or does it all sort of blur together for you? TN: It’s my take on all those styles, those songs. I didn’t try to match the originals in any way; if I could, I might! But really, there’s no point in that. “It’s a Sin” I’ve always loved; it’s a Jimmy Reed tune, so we did it quite a bit more rushed than he did it. BK: …you’ve got one on the title track. It has a peculiar sound, sort of plucky and totally lacking in sustain. Where did the idea come from to use that? But he said, “But I have a banjolin,” which is a combination of a banjo and a mandolin. So I said, “Cool. Bring it.” I had never heard or seen anything like it. BK: I have a few of your vinyl albums from way back: Come See About Me, and a pair of Mother Earth albums — Satisfied and the self-titled one. What’s remarkable to me is that even though those go back in some cases more than forty years, your voice doesn’t sound all that different. Do you practice to keep your vocal instrument in shape? TN: [hearty laughter] When I listen to those old records, it sounds to me like it’s somebody else. I had a much purer, higher tone. But I’m not unhappy with the way I sound now; my voice has just matured. But those records, it sounds to me like some little girl. I like the way I sound now, but I hear a huge difference. I’m very protective of my throat. Partly because I’m lazy: because I know I could hurt my voice, I don’t push it very hard. I don’t work clubs where I have to do two sets a night. When I’m singing, I know — from fifty years’ experience — what’s gonna hurt my throat. I’ve never had polyps or any of those problems. I do have to warm up now before I sing, but otherwise, no, I don’t practice. Cyndi Lauper has been beating me up for months to get some vocal lessons so I could get the high notes back; I had told her I lost some of them. And she told me, “Of course you can get them back.” And she’s right. I should do some work to get back to where I’d like to be. BK: All eleven songs are covers; some are quite old standards, some are contemporary. They’re written by a variety of people. But I hear a common thread throughout them. I imagine you do, too. Can you comment on that? The Earl Thomas song [“Lead a Horse to Water”] and the Joe Tex song [“The Love You Save (May Be Your Own)”] and “Without Love (There is Nothing)” [originally by Irma Thomas], those three are all in an early r&b feel. The rest of them, to me, are Chicago blues songs. When I listen to what Jimmy Pugh did on the record, it’s like a different keyboard player on every song. There’s some B3, some piano, some Wurlitzer [EP200 electric piano]. BK: I love the texture of the Wurlitzer. It always reminds me of Ray Charles. TN: “What I’d Say” is the first song I learned on piano. I mean, I’d studied classical piano, but it did me absolutely no good. But the first song I ever sat down and learned to play, in a rock’n’roll or blues style, was that. But it has to be on Wurlitzer. BK: How did the arrangements for the song come together: did you get together and rehearse the songs or was everything charted up for everyone? TN: I went in and played them the [original] tracks. They pretty much knew most of the songs anyway. I know that they will play the song and do something wonderful with it. I never try to arrange for them; occasionally I might have an idea – one little thing here or there – but for the most part, that’s how we always do it. That’s how to do it: use the great engineer, the great producer, the great players. I just sit back and sing my songs. BK: I very much like the fact that the liner notes on Victim of the Blues give context and explanation for each of the tracks. Do you think that that background adds to listeners’ understanding and appreciation of the music? TN: I did that because I was asked to. I don’t know…maybe it does [add to it] but that’s not why I did it. We did this whole project ourselves. We cut the tracks without the aegis of a label. We presented them with the final “everything.” Including the artwork. So Mindy [Giles], my manager, asked me to write blurbs on the songs. So I did. [laughs] I always do what I’m told.